Bio: Born 1970 and raised in San Juan, Puerto Rico, Sharon Pomales is a contemporary realist artist working in oil and pastel. At the age of seven she took drawing lessons with renowned Argentinean portrait artist Antonio Gantes. Sharon kept studying drawing and painting with her father, Raul Pomales-Ledee, a watercolor artist, commercial illustrator and Art Director who worked in Advertising in San Juan and was her mentor and teacher until he passed away in Orlando, FL in 2006. Sharoin studied Visual Arts for 3 years at Sacred Heart University with artists Mary Ann MacKinnon and Rafael Marquez. A few years later she returned to college and graduated with a bachelor’s degree in Psychology. 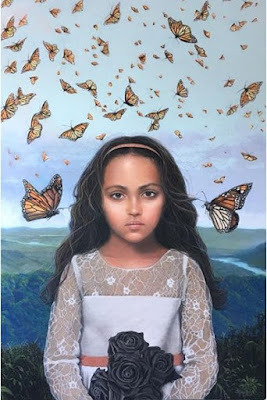 She returned to painting full-time in 2007 and in July 2008 her piece “Self-portrait/heartbroken” was chosen to be part of the prestigious 15th Annual Auction of Latin American Art in San Juan, Puerto Rico. Since moving to Ohio in 2012 she has exhibited at various galleries, institutions, and museums nationwide and internationally. Her work has been featured in various publications, including the February 2018 ussue of the Pastel Journal. Sharon is a member of the Portrait Society of America, American Women Artists, International Guild of Realism, Allied Artists of America, and is a Signature Member of the National Oil and Acrylic Painters Society and the Pastel Society of America. Gallery/ Image View: Click on the image under “Paintings” to scroll through her pastels and oils.